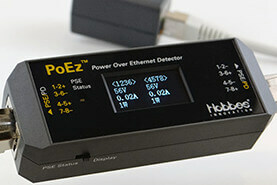 Hobbes Group, the global leader in professional network equipment today announced PoEz Power Over Ethernet Detector/PoE Tester, a battery-free PoE test tool for PoE system installation and troubleshooting. Part of the core technology of PoEz Power Over Ethernet Detector/PoE Tester comes from PoE Checker/PoE Tester, which can perform inline test of PoE system to receive real-time voltage, current and power draw. PoEz Power Over Ethernet Detector/PoE Tester can support IEEE802.3AF, IEEE802.3AT, UPoE, Hi-PoE and IEEE802.3BT standards. It is the only PoE tester on the market that is compatible with all PoE type and standard. PSE device generating a transient pulse that is over the voltage range of a PD device maximum capacity can cause damage to the PD device. Powered pairs of PSE not attaining the required power of PD device will cause PD to malfunction and/or nonoperational. Through the LED light of the PoEz Power Over Ethernet Detector/PoE Tester, you can quickly determine whether the PoE switches or injectors will transmit signal (via handshake) before supplying power. You can avoid damages to PD by identifying the power supplied by PoE switches and injectors. The PoE system is an integrated system that is more prone to having compatibility problems than a single device. The PoEz Power Device Simulator (PDS) can simulate as a PD, so you can quickly identify the device that may cause problems. Because of most PoE devices such as PoE switches, PoE injectors and IP cameras operate continuously for 24 hours, the PoEz Power Over Ethernet Detector/PoE Tester can monitor the real-time voltage, current and power stability to ensure the safety of electricity flowing to PD. To find a distributor in your region, please visit Hobbes Agent. Hobbes is the global leader in manufacture of professional test, and measurement equipment for network and telecommunication industry since 1985. Our innovative products and services protect and optimize transmission networks in any environment-from the smallest mobile device, to the enterprise data center, to cloud-based systems give our customers confidence to connect the world. For more information, please visit our website: https://www.hobbes-group.com or our partners.